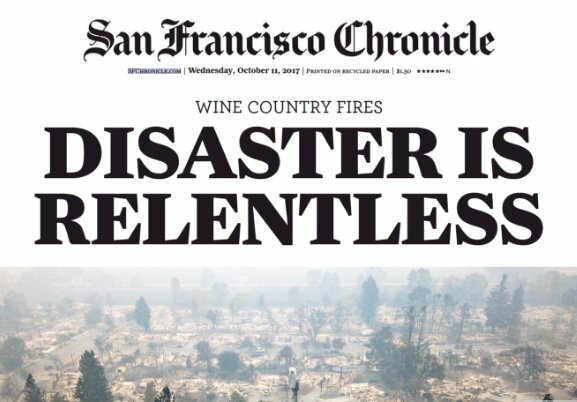 About this week: The SF Chronicle’s Oct. 11th front page summed up the past week for me. “Disaster is relentless.” I grew up in the Bay Area and I’ve spent a fair share of my waking hours over these last two weeks tracking these fires, mourning the loss of places and landscapes that I knew as a young(er) person, and thinking about the distance between the glossy, noir images of apocalypse that populate representations of California (Gold Fame Citrus being a more recent example, for more of them, one might turn to Mike Davis’s Ecology of Fear). I re-read this Marie Howe poem often. My survival strategy: thinking about art and art making in relation to feminism. A good place to start might be Linda Nochlin’s controversial 1971 essay, “Why Have There Been No Great Women Artists?” (Artnews, and this past May Hyperallergic published this illustrated guide to Nochlin’s essay.) A decade later, Lucy Lippard published “Sweeping Exchanges: The Contribution of Feminism to Art in the 1970s” (Art Journal). Why just think about art when you can get out and see it? Ruth Asawa finally gets to climb out of the “domestic” box now that David Zwirner is representing her estate. MoMA is showing Louise Bourgeois. Mieke Bal and Anne Wagner have both written interesting pieces on Bourgeois. Katy Deepwell on “Why Louise Bourgeois is a feminist icon.” In this interview with Kang Kang, Lin Tianmaio discusses her career as a female artist in China, her relationship to feminism–and why she does not claim to be a feminist artist (though that might be the least interesting part of the interview). Kara Walker’s show closed on October 14, but you can read one more review here. Carolee Schneeman has a show opening at MoMA P.S. 1. on Oct. 22nd. Read this Bomb magazine interview with her and then go see it.